Yesterday saw the opening of “Down the Road” in Kensington, Whangarei. Justine and Joseph Start have spent recent months preparing their new Eatery and Deli and the food is proudly local. When you choose to eat at Down the Road you are also supporting a lot of local producers. These include Grinning Gecko Cheese, Mahoe Farms Cheese and Hydro Healthy to name just a few. If you support local food, eating at “Down the Road” is a great option. Tropical Fruit Growers is on a roll! On 8 April Tropical Fruit Growers New Zealand had their inaugural public meeting at Northland Inc’s Orchard. Attendance exceeded expectations and now the TFGNZ has over 100 members. Here is Hugh’s report from the meeting. Some images are added from the TFGNZ Facebook page. What a meeting! Thank you everybody for your support and TFGNZ is all go. TFGNZ is the result of a group of people – all passionate about what they are growing – getting together, discussing, sharing and comparing what they are doing and what is possible. The most important asset of TFGNZ is our Members. With that in mind I would like to set out the immediate agenda as I see it and welcome suggestions to take to the next committee meeting. The commercial growing of bananas in Northland is not a new idea but for one reason or another it has never gotten off the ground. With the downturn in the dairy economy the time is right for this to happen and I intend over the winter months get TFGNZ in front of the dairy industry so we are seen as the authority for expanding the planting of banana crops to supplement incomes and provide inexpensive feed for animals. This is a win-win situation all round as bananas quickly convert effluent into biomass and clean-up waterways. We need to complete the incorporated society process, Once this is done we can apply for funding for funding into research as to the nutritional benefits of banana plants for cattle feed and the nutrient levels of the locally grown fruit compared to imported fruit. As I understand it we will be able to receive funding for this research from M.P.I and other agencies. Please, if you have any bananas growing that you are able to add to the crop register please let us know or contact Matt Stanley matt@maplekiwi.com who is compiling a database of source materials. TFGNZ will introduce its own system to identify commercially grown produce and certify organic status or otherwise. October onwards is the planting out season for bananas so in September land needs to be cleared and stems harvested. We will coordinate teams for this purpose as required. We will be able to get existing work crews to head out and collect the stems and plant them on a grand scale by working in with the various existing agencies as each hectare of land will require over 1000 plants. These plants are anticipated to be sold at around $10 each with a minimum of $1 per stem going to fund TFGNZ so any donated stems will help operational costs in the early stages. Organising new plantings advising on existing plantation will greatly increase the TFGNZ profile. With commercial plantings they will initially be done with donated and low cost stems, different varieties going into each plantation. These initial stems will be monitored and those that produce the best results at each location will be cloned using tissue culture techniques to fast track the establishment of viable orchards. As fruit comes into production then the distribution process will coordinate the flow of fruit so it reaches the consumer in optimum condition and those requirement figures are staggering! Population of Northland is 171,400. At 18Kg per person per year, that makes 3085 tons consumed annually. Population of NZ is 4,781,000. At 18Kg per person, that makes 86,000 tons. At $2 per kg that’s 172 million dollars with which to create employment and industry for Northland and who knows in time there may even be some to export! It’s not all about bananas! Field trips are to be organised and other activities if anyone wishes to help in this area please let us know don’t be shy, if you have any skills you think may be useful same applies. This is a voluntary role however expenses will be met. Lastly my bombshell for those who know me – you heard it here first! Rukuwai Farm is about to go on the market! Yes up for sale and why, you may ask? Six months ago we applied to WDC to subdivide so we could sell off our house and rebuild down where I do all the growing, plantation/market garden and create a water garden to display Pauline’s Lotus plants. Sadly six months on owing to the constraints of the resource management act nothing has progressed other than the depletion of our reserves as yet another report is required. Please do not think I am having a go at WDC far from it, simply it is the framework they are obliged to work within under the resource management act however when you are 65 years of age and have still got lots to do six months is far too long for us! So we have made an offer on another property which if accepted will see us relocating – not far but it will be to a place that needs some TLC and meets our criteria for water gardens and tropical fruit. Of course if you know anyone who wants a production platform mostly flat river silt around 100 acres with proven horticultural returns, a nice new modest home, heaps of plantings and a developing banana plantation give me a call. We are heading into the long weekends so please, take care everybody, enjoy the break and after the committee meeting and debrief on the 18th our very first newsletter will be issued! At the recent New Zealand Champions of Cheese Awards, two Northland companies came out on top. Cathy Oakley of Winsam Farm near Kerikeri and her husband was named the Champion Cheesemaker for her sheep milk cheese. It was her first year in the competition. You can read more about her here. Grinning Gecko’s brie was named the nation’s best soft white rind cheese, and Zev Kaka-Holtz was named the best aspiring cheesemaker. His is a story that celebrates local enterprise. You can see his story in a short Seven Sharp feature. Other awards were won by Mahoe Farmhouse Cheese and George’s Cheeses from Kerikeri. Banana maths – a Northland banana industry? What would a Northland Banana Industry be worth to the local economy? Bananas are starting to appear regularly at the Whangarei Growers Market. There are many variables to consider to refine these numbers, but they act as a reference point. Earlier studies reveal that produce grown locally rather than imported into the region (and country in this case) create a 2 to 4 times multiplier in both jobs and dollars. The report, The Social and Economic Impact of the Whangarei Growers Market identified the multiplier at 2.99. This work was done by economist Dr Warren Hughes. 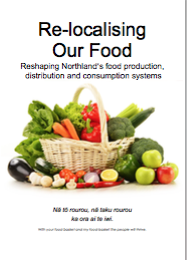 So let’s be conservative and aim to supply 10% of Northland’s bananas, 300,000 kgs or 300 tonnes by 2025. The nearby Auckland market could probably take all we could produce. Currently, local bananas are selling for more like $8.00 a kilo, but as production increases we can anticipate the price reducing – so these estimates are conservative. Realising this $3.6 million industry would be challenging. Bananas required frost free locations. They can handle light infrequent frosts and surely we have plenty of microclimates where we could grow them. It would also require a significant number of banana plants to be propagated. Perhaps tissue culture is a solution. The other requirement would be for roughly 10% of Northlanders to buy Northland bananas exclusively – this is an appealing challenge, because it provides an opportunity to support the local industry and to access a product that is much healthier. This post is based on an article written in Organic NZ Magazine written by Theresa Sjoquist. The article is also reproduced on this website to compile a resource on banana growing in Northland. Growers are planning a mid week market to provide a daytime and after work venue for business people and others who would like to buy the same fresh vegetables, fruit and produce they already enjoy on Saturday. Prices will be basically the same along with many stallholders. Starting Wednesday, October 19th 2.30pm – 6.30pm at the corner of Wood St and Railway Road. Genuinely interested stallholders who have the produce to sell, are welcome to give us a ring. Rules will be few but one essential is that the Grower attends with his own produce. A member of the family or someone who knows the growing processes well, can stand in, BUT there is to be NO ‘on selling’ of others’ goods. A Community stall is going to be provided where people can plan to have their veg and fruit etc., (with a 15% commission being charged) sold on their behalf. All growers with produce need to provide some detail of the name of their farm and the most interesting aspect of the crop for display to the buyers. We have so much interest at present that we may have to look at size of venue, but for the present the new market will run for four weeks before we all have a meeting and swap ideas on our collective findings. Growers will be expected to arrive for those four Wednesdays, rain, hail or shine by at least 2pm the first day. Lesley A’Court: 09 438 7868 leave a message. Cleared late afternoon. What is the value of healthy fresh food? Lesley is a well known local grower, selling delicious strawberries, fermented foods and preserves in markets around Northland. Growing and gathering ‘food’ be it fruit, veg, fish, dairying, cereal or collecting honey as a business is a fulltime job. The results are what we all need to keep healthy. Much now is retired people working hard living off a pension. Since then the world has become faster and more ‘clever’ in the lining of individual pockets that have never soiled their hands. This was at first very useful as the growers could produce more than they could themselves sell at the local outlet. It then grew, and became a much easier way to earn a ‘middle man’s living’. Slowly but very surely the growers became the losers financially, and ended up in most cases being completely dependent on these ‘helpful’ distributers of their goods. We now have a situation where the tradition of all these hunters and gatherers are not a viable choice for young people, and it becomes a commonly held thread that they all need to leave and ‘go to the city’. The public haven’t understood this is happening but growers have been slowly ground down so they can’t live off their fulltime job. Many ‘retire’ from a thankless task. Some have gone bankrupt and lose all (think Callas, Sandesonia, deer velvet, ostrich eggs, orchids, recently dairying etc.). I know growers who are getting the same money for their produce as they did 30years ago!!! Who would stand that in their office job? About 20 years ago the growers realized that the situation was dire and was caused partly from the poor quality produce arriving from overseas. (if you pick unripe with no sugar content in order to send overseas and have it ripen at the other end, of course it tastes of nothing) and their financial losses were becoming worse through middle men ‘clipping the ticket’ SO… they started up local markets where you could sell fresh, tasty, often tree ripened produce in season. Producers could sell their ‘made yesterday’ beautiful cheeses, yoghurts, sauerkraut, kimchi, kombucha, salamis etc. The growers can expect top quality prices for their top quality food and the customer is fully aware of the history of their purchases and have a good relationship with their supplier. The idea has taken off worldwide, and is growing. If the producers can earn the correct money for their hard work then the whole community benefits with more money and jobs circulating. We are going to lose our good growers in NZ if we don’t support them. Good food markets are not where you go to pick up bargains. Prices should be more than the supermarkets. Quality product deserves quality money, like the rest of sociey earns.